How much would you pay to have faeces in your coffee? $35? $100? Or maybe, the life of an innocent animal that is forced to eat only coffee beans to fuel a lucrative novelty trade? 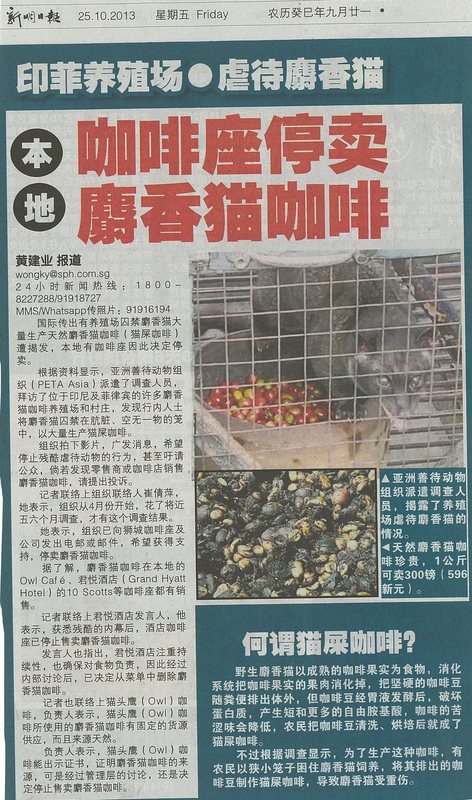 TOC got in touch with Henrietta Woo from Project LUWAK SG, a locally-born group dedicated to increasing awareness about the cruelty of farmed kopi luwak, and in the process save the common palm civet from, literally and figuratively, a whole load of crap. Tell us a bit more about your group – who you are and how you came together. We are Project LUWAK SG Singapore, a group whose objective is to raise awareness of the cruelty behind kopi luwak (civet poop coffee) among both coffee retailers and consumers. Our focus is on outreach and education, which sees us being active on social media, blogging, writing to coffee retailers as well as establishing partnerships. The ‘LUWAK’ in our name stands for ‘Love oUr Wild civets, Avoid Kopi luwak’ which we think nicely sums up our stance towards kopi luwak from caged civets. If kopi luwak beans were sourced from the faeces of wild civets, and if there were a certification body to guarantee assurance, we wouldn’t have an issue with it. Project LUWAK SG was formed very recently, in October 2013. It all started when my mum told me that a local coffee house was selling kopi luwak as its signature drink. It prompted me to do a quick search online and I found that kopi luwak was starting to gain popularity in Singapore. Deciding to pursue the matter, I sought out Xu Weiting and Fung Tze Kwan, who are both common palm civet researchers in Singapore, for their advice. Like-minded friends Chloe Tan, Germaine Leng, Joys Tan, Pearlynn Sim, Esther Wee, Mary-Ruth Low, Fahmi Samsuri, Gladys Chua, Sofina Ng joined shortly after. I know there is some long history behind it, but very briefly – kopi luwak, what is this about? Kopi luwak is said to be an innovation by native farmers and plantation workers in the Dutch colony of Java in the 1690s. They were prohibited from picking coffee cherries for personal consumption. This problem was circumvented when they observed undigested coffee beans in poop left behind by civets that had wandered into the estate to feed on coffee cherries. Harvested, washed and dried, the first cup of kopi luwak was made. Apparently, after word got out, the wild-sourced kopi luwak became much sought after and fetched a premium even then – owing to the difficulty in obtaining it as well as the limited supply. Fast forward to the present: a former coffee trader from Britain, Tony Wild, introduced the West to kopi luwak in 1991, and it suddenly catapulted into international fame. To meet increasing demand, kopi luwak farms would cage wild civets and feed them an exclusive diet of coffee berries, which is not what civets normally eat in the wild. Needless to say, the impact on the environment and the health of the civets is clearly negative. Wild actually started a campaign recently to try to put an end to it. Around the same time, an impactful BBC documentary entitled ‘Coffee’s Cruel Secret’ was aired. What made you want to embark on this campaign? Looking back to October 2013, I remember feeling riled up upon realising that kopi luwak was taking root in Singapore. At the same time, I wondered whether I had the ability to change things. Kopi luwak was something that was created, and it was okay at first being wild-sourced and all. Then caging civets with the purpose of farming started because demand soared, driven by curious customers. Personally, I think if consumers knew what went into making kopi luwak they would be less likely to touch it. We think that the great hype over kopi luwak is mainly due to its novelty. It received the lowest cupping score (evaluation of the taste and aroma of brewed coffee) by the Specialty Coffee Association of America when ranked against several regular coffees. Also, it would probably put a sizable dent in someone’s ego to admit to shelling out good money for awful-tasting coffee made from poop, so the myth (in our opinion) that it is a great coffee is perpetuated. If consumers already know what goes into making it and still want to drink it, it’s really their choice in the end. But the first step is in raising awareness and hence Project LUWAK SG’s focus is on outreach and education. You must have gotten this often: Why bother with civets, when they do not affect our daily lives at all? Actually, TOC is the first to ask us this. The typical species used in making kopi luwak, the common palm civet, can be found in Singapore and it is our last wild urban carnivore. They occupy important ecological roles such as seed dispersal – which local research is investigating (see here and here) – that aid in keeping the ecosystem functioning. Though we don’t rely on the natural environment directly in Singapore (e.g. for food), we derive other benefits from it such as the purification of air, regulation of climate – which require a healthy ecosystem. Nature is resilient but removal of any one component does affect its ability to function. Hence, it is more correct to say that civets do not affect our daily lives directly, rather than “at all”. Conversely, as consumers, through our choices, we can directly make a difference to the welfare of civets. Is civet-poop coffee very prevalent in Singapore? What’s our impact on the international trade as a whole? I’ll focus on the consumption as production is non-existent in Singapore. While kopi luwak is not widely sold in storefronts here, the online market appears to be sizable. And this is not surprising as our spending power puts us in the market share for which kopi luwak is pitched at. It is expensive, but the majority here can afford it. Singaporeans also travel frequently and our tourist dollars go some way in supporting kopi luwak. Visits to neighbouring countries such as Indonesia and the Philippines – top exporters of kopi luwak – often involve some form of exposure to it, whether at a tasting session (typically included in tours) or a souvenir shop. As a whole, we are definitely driving demand which fuels the trade but to what extent remains unknown. There are no exact figures, but I would say that our potential to drive market forces is high. What’s the reaction you get when you tell people about it? Most people whom we have told have heard about kopi luwak and are curious about it. Others are repulsed. One thing in common across the two groups is that most of the time they do not know how cruel caged-sourced kopi luwak is. After we tell them about it, they get quite mortified. I guess they would eventually become detractors of kopi luwak, if not immediately. On the other hand, we have encountered ardent kopi luwak supporters who maintain that they get their beans from wild civets. Unfortunately, there is no way at present to prove this as a certification body does not yet exist. You have day jobs? Because I see you getting a lot of hate mail, but not likely many cheques. About half of us are working, while the rest are university students. We currently operate with zero funding. Our car decals were kindly sponsored by SKL0. These sport our logo, which was designed by a friend and volunteer, Sharon Bong. Also a volunteer at first, Esther – who’s behind the infographics – has now joined the team as our resident artist. We welcome collaboration from interested parties to join us in raising awareness! What do you hope to achieve with this campaign, and what progress have you made so far towards your goal? Share your ups and downs. We hope that people, coffee retailers and consumers alike, will sit up and take notice of the ills of kopi luwak and act for civets. Through this campaign, we also want to encourage consumers to not drink and/or purchase kopi luwak as well as for retailers to not sell or endorse it. We also hope that our efforts will contribute to the larger objective of raising awareness about animal welfare and exploitation. Coincidentally, later in the same month we were formed, an article was published in Shin Min about two local cafes that have decided to stop selling kopi luwak (English translation here). This breakthrough was the result of investigations and pressure from the People for the Ethical Treatment of Animals (PETA Asia). All of us hope that more coffee retailers will follow their lead in time to come. Animal welfare groups such as Project: WILD, Society for the Prevention of Cruelty to Animals (SPCA; Hong Kong, Selangor and Singapore), and the Animal Concerns Research & Education Society (ACRES) have since picked up our infographics and shared them. SPCA Hong Kong kindly translated the infographics into Chinese which will enable a wider reach. A few days’ back, a collaboration with Jonna Lehtinen, a primate researcher in Bali, was forged. She is helping to distribute the infographics at main tourist sites/restaurants, and there are also indications of interest to circulate it in other parts of Indonesia. Locally, we were featured in The Straits Times’ Causes Week 2013 and will soon embark on a collaborative effort with Nanyang Girls’ High School. I think it’s an understatement to say that these are exciting times ahead. The road ahead may be long, but we’re slowly increasing our reach and are buoyed by the support from new partnerships. What are the next steps for your group? The next steps would be to sustain interest by engaging our audience with new material, stepping up efforts to establish ties with coffee retailers in Singapore, and to seek out new partnerships. What can the guy on the street do to help you? He/she can check out our blog and Facebook page to learn more about the cruelty behind kopi luwak and spread the word about it. We would also appreciate having ‘extra’ eyes and ears on the ground i.e. let us know if kopi luwak is being sold in Singapore or even write directly to the person(s) involved. Also take our pledge to say ‘no’ to kopi luwak!